The French Quarter is one of the oldest sections of the city in New Orleans. The city has a lot of historical buildings which were built in the 18th century. Check out your options for the best Airbnb vacation rentals in the heart of the French Quarter, New Orleans. This is a luxurious house located in the Giani building in the center of Downtown New Orleans. This building is located walking distance to the historic French Quarter and the famous Bourbon Street. There is also an indoor cabana and a swimming pool. The beautiful outdoor rooftop deck overlooks the beautiful energetic Canal Street. This house has one bedroom and a queen bed in it. There is a fully equipped kitchen with washer and dryer. The best part about this house is its 19th-century exposed brick wall. This Marigny Gem is a fully-furnished luxury condo in the famous Faubourg Marigny neighborhood. There are hardwood floors and quartz countertops in this condo. The French Quarter, Bourbon Street, Bywater, Treme and Frenchman Street are all located close to this place. It is located on the second floor of the building. There is one bedroom, a living room and a kitchen in this condo. This is another apartment located in the Giani Building. It has a bedroom, living room and fully-equipped kitchen. There is also WiFi and a TV in this apartment. Guests can easily access the rooftop swimming pool and cabana. The building is located in the center of downtown New Orleans. The famous Bourbon Street is quite close to this place. Check into this lovely Bourbon Street guest house located in the heart of the French Quarter. Guests will have access to the shared courtyard between the main house and the guest house. There’s a queen-size bed and a sofa bed, comfortably accommodating up to two guests. WiFi is provided, as well as a TV to keep you entertained after a long day. Guests are also welcome to use the fully-equipped kitchen to whip up their own meals during their stay. This apartment is located in the 19th-century building. It has a bedroom with a queen sized bed. The living room has a TV and there is also a well-equipped kitchen. Guests can also access the rooftop swimming pool and cabana. The famous Bourbon Street is quite close to this place. The building is located in the center of downtown New Orleans. This house is located in exposed 19th-century style brick wall building. There is a total of two bedrooms in this house with two king beds. There is also one queen sofa bed and two queen air mattresses. The house also has washer and dryer, and there are three HD TVs and a cabana and swimming pool in this building. This downtown apartment is located in the newly built Giani Building in downtown New Orleans. With a beautiful rooftop swimming pool and indoor cabana, this is a beautiful and unique place to live in. The entire building is designed in brick wall style. There is one bedroom and a living and kitchen area. The kitchen is fully equipped and has all of the basic amenities. 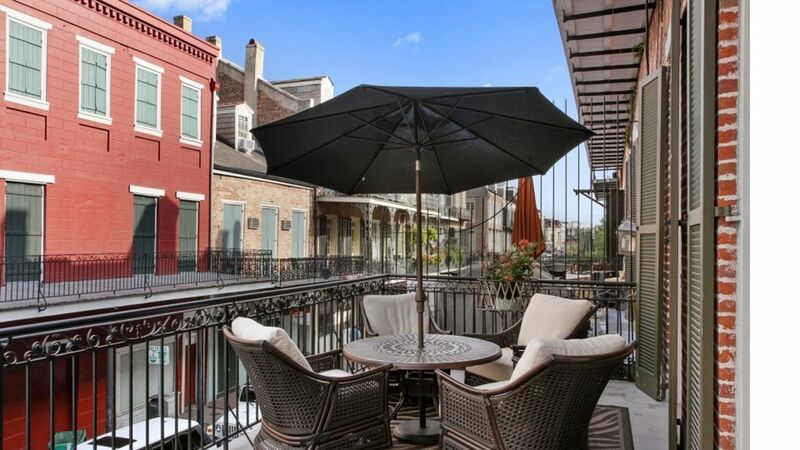 Book a stay in this incredibly decorated balcony apartment located in a historic building in the French Quarter. The bedroom has a queen-size bed which will comfortably accommodate two guests, there’s also a sofa bed in the living room if you’re looking for other sleeping arrangements. Modern amenities include WiFi and TV (with Apple TV). This is a historical and recently renovated one-bedroom apartment in New Orleans. It is steps away from the best nightlife and antique shops of Royal Street. It is located on the first floor. The bedroom has one queen sized bed and also a queen sized cabinet bed. The kitchen is fully equipped and contains all of the basic amenities. There is also a TV and WiFi in this suite. This apartment is located in a quiet location, near quaint row house and mini-mansions abound. It is a beautiful and wonderful front porch area. There is plenty of space in the living room. The apartment also has air conditioning and a heating system. The apartment has access to the backyard, which has palm trees and a grill. There is also a front porch in this apartment and it has a large gallery-style kitchen. This is a beautifully located balcony apartment on the third floor on world famous Bourbon Street. There is a host bar and a private balcony for guests to enjoy some precious moments. The host bar is usually stocked with sodas, juice and other mixers. The bedroom has a queen size pillow top bed whereas the living room has a pull out sofa that can easily sleep two people. There’s a large Beauty Rest blow up mattress if needed. For an additional 80 USD nightly, two more guests can be accommodated. Located between Royal Street and Bourbon on Ursuline Avenue, this is a small studio apartment. This studio apartment is in the heart of the French Quarter. This house is only three blocks away in the Marigny, just off Frenchman Street. The famous Mississippi River is a short five-minute walk away. This apartment is located close to restaurants, shops, groceries and coffee shops too. There is one queen sized bed in the bedroom. The kitchen is fully equipped. This penthouse is Plus verified, so you know you will get value when you stay here. Set on the 15th-floor, expect stunning panoramic views. There is access to a rooftop terrace with an infinity pool and access to a fitness center. With a bathroom and a bedroom, the host guarantees comfort for a maximum of four guests. It even has a study area where you can work. The apartment is ideally situated just one block from Bourbon Street in the French Quarter. You may also choose to explore Canal Street or visit the Orpheum Theater. Otherwise, consider wandering around Louis Armstrong Park. If you are looking for a nice place to eat breakfast, the Goldberg’s deli/restaurant is around the corner. This beautifully renovated home offers guests both comfort and privacy. Situated a block from the French Quarter, this historic home has a private outdoor area that is furnished with a bistro table. It sleeps up to three guests in one bedroom, with one bed and 1.5 baths. The living room is comfortable and the full kitchen has everything you need to self-cater. Television, WiFi connectivity, and an iron are provided. With restaurants, bars, and shopping in the area, you will be able to get out and explore on foot. The neighborhood is quiet and the locals are friendly. Frenchmen Street is not far away and there is access to Uber and Lyft to get down to Bourbon Street. For entertainment, there are clubs where you can dance, or just listen to music. Book any of the amazing apartments in the French Quarter and cherish your trip.